An in-depth report on the causes, diagnosis, treatment, and prevention of stroke. FACE. Ask the person to smile. Check to see if one side of the face droops. ARMS. Ask the person to raise both arms. See if one arm drifts downward. SPEECH. Ask the person to repeat a simple sentence. Check to see if words are slurred and if the sentence is repeated correctly. TIME. If a person shows any of these symptoms, time is essential. It is important to get to the hospital as quickly as possible. Call 9-1-1. Act F.A.S.T. Recently, so called 'stent retrievers' have been introduced in patients with acute embolic stroke. These devices can be threaded into the blocked artery for removal of the clot or thrombus. Migraine with aura, which occurs more frequently in women than men. Preeclampsia, a pregnancy-related condition marked by dangerously high blood pressure. Oral contraceptive (birth control pill) use, which becomes even riskier for women who smoke, have high blood pressure, or are older. The consequences of a stroke, the type of functions affected, and the severity depend on where in the brain it has occurred and the extent of the damage. The basilar artery forms at the base of the skull from the vertebral arteries, which run up along the spine, join, and come up through the rear of the neck. 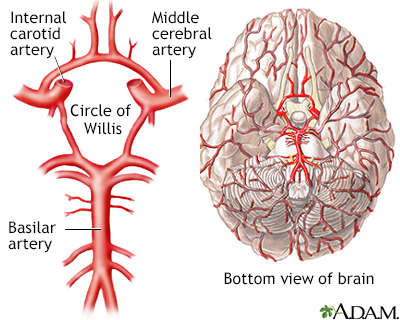 The Circle of Willis is the joining area of several arteries at the bottom (inferior) side of the brain. At the Circle of Willis, the internal carotid arteries branch into smaller arteries that supply oxygenated blood to over 80% of the cerebrum. Blockage of blood flow to the brain for even a short period of time can be disastrous and cause brain damage or even death. Ischemic strokes are by far the more common type, causing nearly 90% of all strokes. Ischemia means the deficiency of oxygen in vital tissues. Ischemic strokes are caused by blood clots that are usually one of four types. The arterial walls slowly thicken, harden, and narrow until blood flow is reduced, a condition known as stenosis. As these processes continue, blood flow slows. The artery is narrowed by a cholesterol-laden plaque that becomes susceptible to tearing. In this event, a thrombus (blood clot) forms. The blood clot then breaks off and travels to the brain, where it blocks an artery and shuts off oxygen to part of the brain. A stroke occurs. In many cases, the blood clots originally form as a result of a heart rhythm disorder known as atrial fibrillation. Emboli can also originate from blood clots that form at the site of artificial heart valves. Patients with heart valve disorders such as mitral stenosis are at increased risk for clots when they also have atrial fibrillation. Emboli can also occur after a heart attack or in association with heart failure. Rarely, emboli are formed from fat particles, tumor cells, or air bubbles that travel through the bloodstream. Thrombotic strokes occur when a clot develops in a diseased artery right in the brain. Thrombotic strokes are less common than either type of embolic strokes. Thrombotic strokes tend to occur at night, and their symptoms may develop more slowly than those of an embolic stroke, which is usually swift and sudden. Lacunar infarcts are very tiny, ischemic strokes, which may cause clumsiness, weakness, and emotional variability. They make up the majority of silent brain infarctions and may result from chronic high blood pressure. They are actually a subtype of thrombotic stroke. They can also sometimes serve as warning signs for a major stroke. Many elderly people have had silent brain (cerebral) infarctions, small strokes that cause no apparent symptoms. They are detected in up to half of elderly patients who undergo imaging tests for problems other than stroke. The presence of silent infarctions indicates an increased risk for future stroke, as well as dementia. Smokers and people with hypertension are at particular risk. A transient ischemic attack (TIA) is an episode in which a person has stroke-like symptoms that typically last for a few minutes and usually less than 1 to 2 hours. Transient ischemic attacks (TIAs) are caused by tiny emboli (clots often formed of pieces of calcium and fatty plaque) that lodge in an artery to the brain. They typically break up quickly and dissolve. But they do temporarily block the supply of blood to the brain. TIAs do not cause lasting damage. But they are a warning sign that a true stroke may happen in the future if something is not done to prevent it. TIA should be taken very seriously and treated as aggressively as a stroke. About 10% to 15% of patients who have a TIA have a stroke within 3 months, with half of these strokes occurring within 48 hours after the TIA. About 10% of strokes occur from hemorrhage (sudden bleeding) into or around the brain. While hemorrhagic strokes are less common than ischemic strokes, they tend to be more deadly. Hemorrhagic strokes are categorized by how and where they occur. Parenchymal, or intracerebral, hemorrhagic strokes. These strokes occur from bleeding within the brain tissue. They are most often the result of high blood pressure exerting excessive pressure on arterial walls already damaged by atherosclerosis. Heart attack patients who have been given drugs to break up blood clots or blood-thinning drugs have a slightly increased risk for this type of stroke. Subarachnoid hemorrhagic strokes. This kind of stroke occurs when a blood vessel on the surface of the brain bursts, leaking blood into the subarachnoid space, an area between the brain and the skull. They are usually caused by the rupture of an aneurysm, a bulge in a blood vessel, which creates a weakening in the artery wall. Arteriovenous malformation (AVM). Is an abnormal connection between arteries and veins. If it occurs in the brain and ruptures, it can also cause a hemorrhagic stroke. On average, someone in the United States has a stroke every 40 seconds. While age is the major risk factor, people who have a stroke are likely to have more than one risk factor. Doctors can calculate an individual patient's risk of having a stroke or heart attack within the next 10 years. The American College of Cardiology (ACC) and the American Heart Association (AHA) have a special "risk calculator" that factors into its equation a person's race, gender, age, total cholesterol, HDL ("good") cholesterol, blood pressure, use of blood pressure medications, diabetes status, and smoking history. These are the critical risk factors for both stroke and heart attack. The ACC/AHA recommend using this risk equation to calculate 10-year risk in patients, ages 40 to 79 years old. A separate calculation is used to estimate lifetime risk for heart attack or stroke in patients starting at age 20 years. People most at risk for stroke are older adults, particularly those who have high blood pressure, are sedentary, are overweight, smoke, or have diabetes. Older age is also linked with higher rates of post-stroke dementia. However, younger people are not immune. Many stroke victims are under age 65. In most age groups, except older adults, stroke is more common in men than in women. However, stroke kills and disables more women than men. This may be partly due to the fact that women tend to live longer than men, and stroke is more common among older adults. Younger women have specific risk factors that place them at greater risk for stroke than men. These risks include migraine with aura, use of oral contraceptives, and pregnancy-related high blood pressure. Hypertension during pregnancy can develop into a dangerous condition called preeclampsia that increases stroke risk. Smoking amplifies these risks, as does the presence of high cholesterol or obesity. All minority groups, including Native Americans, Hispanics, and African-Americans, face a significantly higher risk for stroke and death from stroke than Caucasians. African-Americans have twice the risk for first-time stroke as Caucasians. The differences in risk among all groups diminish as people age. The greatest disparity in risk occurs in young adults. Younger African-Americans are two to three times more likely to have a stroke than their Caucasian peers and four times more likely to die from one. They also face a higher risk for death from heart disease. African-Americans have a higher prevalence of obesity, diabetes, and high blood pressure than other groups. However, studies suggest that socioeconomic factors also affect these differences. A family history of stroke or TIA is a strong risk factor for stroke. People who smoke a pack a day have more than twice the risk for stroke as nonsmokers. Smoking increases both hemorrhagic and ischemic stroke risk. The risk for stroke may remain elevated for as long as 14 years after quitting, so the earlier one quits the better. Unhealthy diet (saturated fat, high sodium) can contribute to heart disease, high blood pressure, and obesity, which are all risk factors for stroke. A heart-healthy diet can reduce the risk for stroke. Lack of regular exercise can increase the risk of obesity, diabetes, and poor circulation, which increase the risk of stroke. Alcohol abuse, including binge drinking, increases the risk of stroke. Drug abuse, particularly with cocaine or methamphetamine, is a major risk factor for stroke in young adults. Anabolic steroids, used for body-building and sports enhancement, also increase stroke risk. Heart disease and stroke are closely tied for many reasons. People who have one heart or vascular condition (such as high blood pressure, high cholesterol, heart disease, diabetes, or peripheral artery disease) are at increased risk for developing other related conditions. A history of a prior stroke or TIA significantly increases the risk for a subsequent stroke. People who have had at least one TIA are 10 times more likely to have a stroke than those who have not had a TIA. People who have had a heart attack are at increased risk of stroke. High blood pressure (hypertension) contributes to about 70% of all strokes. People with hypertension have up to 10 times the normal risk of stroke, depending on the severity of the blood pressure and the presence of other risk factors. Women with hypertension are at greater risk than men for having a first stroke. Hypertension is also an important cause of so-called silent cerebral infarcts (mini-strokes caused by blockages in the blood vessels in the brain), which may predict major stroke. Controlling blood pressure is extremely important for stroke prevention. Normal blood pressure is below 120/80. High blood pressure is generally 140/90 or above. A high total cholesterol level increases the risk of developing atherosclerosis ("hardening of the arteries") and heart disease. In atherosclerosis, fatty deposits (plaques) of cholesterol build up in the arteries of the heart. Coronary artery disease (heart disease), the end result of atherosclerosis, increases stroke risk. Anti-clotting medications, which are used in heart disease treatment to break up blood clots, can increase the risk of hemorrhagic stroke. Atrial fibrillation, a major risk factor for stroke, is a heart rhythm disorder in which the atria (the upper chambers in the heart) do not beat in a coordinated fashion, which often makes the overall heart rate fast and irregular. The blood stagnates instead of being pumped out promptly, increasing the risk for formation of blood clots that break loose and travel toward the brain or other parts of the body. The stroke risk for patients with atrial fibrillation is generally highest for those older than age 75, with heart failure or enlarged heart, coronary artery disease or other atherosclerotic vascular disease, history of blood clots, diabetes, hypertension, women, or those with heart valve abnormalities. Dilated cardiomyopathy (enlarged heart), heart valve disorders, and congenital heart defects, such as patent foramen ovale (opening between the upper chambers of heart (atria)) and atrial septal aneurysm (bulging of wall between the atria), are risk factors for stroke. 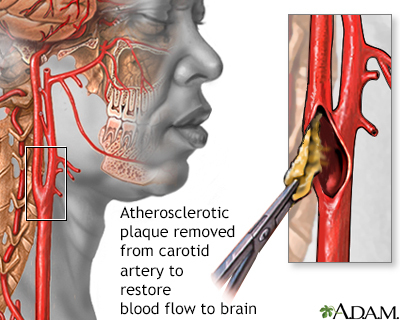 Carotid artery disease is a serious risk factor for stroke. Atherosclerosis can cause fatty build-up in the carotid arteries of the neck, which can lead to blood clots that block blood flow and oxygen to the brain. People with peripheral artery disease, which occurs when atherosclerosis narrows blood vessels in the legs and arms, are at increased risk of carotid artery disease and subsequently stroke. Hypertension is a disorder characterized by chronically high blood pressure. It must be monitored, treated, and controlled by medication, lifestyle changes, or a combination of both. Heart disease and stroke are the leading causes of death in people with diabetes. Diabetes is second only to high blood pressure as the main risk factor for ischemic stroke. The risk is highest for adults newly diagnosed with type 2 diabetes and patients with diabetes who are younger than age 55. African-Americans with diabetes are at even higher risk for stroke at a younger age. Diabetes is strongly associated with other stroke risk factors such as obesity and high blood pressure. Diabetes does not appear to increase the risk for hemorrhagic stroke. Obesity is associated with stroke risk factors such as diabetes, high blood pressure, and unhealthy cholesterol levels. Obesity may also increase the risk for both ischemic and hemorrhagic stroke independently of these other risk factors. Weight that is centered around the abdomen (the so-called apple shape) has a particularly high association with stroke, as it does for heart disease, in comparison to weight distributed around hips (pear-shape). Obesity is particularly hazardous when it is one of the components of metabolic syndrome. This syndrome is diagnosed when at least three of the following conditions are present: abdominal obesity, low HDL cholesterol, high triglyceride levels, high blood pressure, and insulin resistance. Because metabolic syndrome is a pre-diabetic condition that is significantly associated with heart disease, people with this syndrome are at increased risk for stroke even before diabetes develops. Lifestyle modifications (diet, exercise, weight loss) can help reduce the risk for stroke in people diagnosed with metabolic syndrome. Studies suggest that migraine headache is a risk factor for stroke in both men and women, especially before age 50. The risk is higher for migraine accompanied by aura, which occur more frequently in women. Women who have migraine with aura and also smoke, or use oral contraceptives, have even greater risks for ischemic or hemorrhagic stroke. Birth control pills, which contain estrogen, can increase stroke risk, especially for women who are older, have high blood pressure, or who smoke. The American Heart Association recommends that doctors screen patients for high blood pressure before prescribing oral contraceptives. For most women, pregnancy carries a very small risk for stroke. However, women who have high blood pressure (hypertension) during pregnancy have an increased risk for stroke. Hypertension during pregnancy can lead to preeclampsia, a dangerous condition marked by high blood pressure and increased protein in the urine. Preeclampsia is a risk factor for future hypertension and stroke, as is gestational diabetes (insulin resistance that occurs during late pregnancy). The American Heart Association recommends that women who have high blood pressure during pregnancy be treated with daily low-dose aspirin until the time of delivery. A daily calcium supplement may also help prevent preeclampsia for women who do not consume enough calcium in their diets. Obstructive sleep apnea is a common sleep disorder that occurs when tissues in the upper airways come too close to each other during sleep, temporarily blocking the inflow of air. Patients with untreated sleep apnea are at increased risk for many heart problems, including stroke. Current guidelines recommend screening and treating sleep apnea in patients who have had a stroke or TIA. People with sickle cell disease are at increased risk for stroke at a young age. Some research suggests that depression may increase the risk for stroke. Nonsteroidal anti-inflammatory drugs (NSAIDs) such as ibuprofen (Advil, Motrin, generic) and diclofenac (Cataflam, Voltaren, generic) may increase the risk of stroke, especially for patients who have other stroke risk factors. Stroke is the fourth leading cause of death in the United States. However, mortality rates are declining. Over 75% of patients survive a first stroke during the first year, and over half survive beyond 5 years. People who suffer ischemic strokes have a much better chance for survival than those who have hemorrhagic strokes. Among the ischemic stroke categories, the greatest dangers are posed by embolic strokes, followed by thrombotic and lacunar strokes. Hemorrhagic stroke not only destroys brain cells, it also poses other complications, including increased pressure on the brain or spasms in the blood vessels, both of which can be very dangerous. However, studies suggest that survivors of hemorrhagic stroke have a greater chance for recovering function than those who survive ischemic stroke. Many patients are left with physical weakness and often have accompanying pain and spasticity (muscle stiffness or spasms). Depending on the severity of the symptoms and how much of the body is involved, these impairments can affect the ability to walk, to rise from a chair, to feed oneself, to speak, write or use a computer, to drive, and to perform many other activities. Patients with ischemic strokes who score less than 10 have a favorable outlook after a year. Only 4% to 16% of patients do well if their score is more than 20. People at risk and partners or caretakers of people at risk for stroke should be aware of its typical symptoms. The stroke victim should get to the hospital as soon as possible after these warning signs appear. It is particularly important for people with migraines or frequent severe headaches to understand how to distinguish between their usual headaches and symptoms of stroke. The symptoms of a transient ischemic attack (TIA) and early ischemic stroke are similar. However, in the case of a TIA, the symptoms resolve and there is no evidence for infarction (brain cell death), for example on an imaging test (CT or MRI). Symptoms depend on where the injury in the brain occurs. The origin of the stroke is usually either the carotid or basilar arteries. The build-up of plaque in the internal carotid artery may lead to narrowing and irregularity of the artery's lumen, preventing proper blood flow to the brain. More commonly, as the narrowing worsens, a clot forms, then pieces of clot break free, travel to the brain, and block blood vessels that supply blood to the brain. This leads to stroke, with possible paralysis or other deficits. The carotid arteries branch off of the aorta (the primary artery leading from the heart) and lead up through the neck, around the windpipe, and into the brain. When TIAs or strokes result from clots that form on blockages in the carotid artery, symptoms may occur in either the retina of the eye or the cerebral hemisphere (the large top part of the brain). When oxygen to the eye is reduced, people describe the visual effect as a shade being pulled down. People may develop poor night vision. About 35% of TIAs are associated with temporary lost vision in one eye. The visual impairment occurs on the same side as the carotid disease. When the cerebral hemisphere is affected, a person can have problems with speech and partial and temporary paralysis, drooping eyelid, tingling, and numbness, usually on one side of the body. The stroke victim may be unable to express thoughts verbally or to understand spoken words. If the stroke injuries are on the right side of the brain, the symptoms will develop on the left side of the body and vice versa. Uncommonly, patients may have seizures. Such strokes usually occur in the brain stem, which can have profound effects on breathing, blood pressure, heart rate, and other vital functions, but have no effect on thinking or language. If the stroke is caused by an embolus (a clot that has traveled to an artery in the brain), the onset is sudden. Headache and seizures can occur within seconds of the blockage. When thrombosis (a blood clot that has formed within the brain) causes the stroke, the onset usually occurs more gradually, over minutes to hours. On rare occasions it progresses over days to weeks. Sudden onset of severe headache. Various neurologic abnormalities. Seizures, for example, occur in about 8% of patients. A diagnostic work-up for stroke includes physical and neurological examinations, patient's medical history, blood tests (to measure blood glucose levels, blood coagulation time, cardiac enzymes, and other factors), and imaging tests. Many of the same procedures are used to diagnose a stroke and to evaluate the risk of future major stroke in patients who have had a transient ischemic attack (TIA). For patients who have suffered a major stroke, the first step is to determine as quickly as possible whether the stroke is ischemic (caused by blood clot blockage) or hemorrhagic (caused by bleeding). Tissue plasminogen activator (tPA), also known as a clot-busting drug therapy, can be life-saving for ischemic stroke patients. But they are most effective when given within 60 minutes of the patient's arrival at the hospital. However, if the stroke is caused by a hemorrhage, thrombolytic drugs will increase the bleeding and can be lethal. Physical and medical exam to ask patient or family member about symptoms, time of symptom onset, risk factors, and any medications the patient is currently taking. Blood tests to check blood sugar (glucose levels), electrolytes, blood platelet count, and other factors. Imaging tests such as computed tomography (CT) or magnetic resonance imaging (MRI). Electrocardiogram (ECG or EKG) to evaluate heart function. Blood sugar (glucose) levels; this is the only blood test that must be performed before clot-buster treatment. Electrolytes and kidney function tests. Complete blood count, including platelets. Cardiac enzymes such as troponin. Computed tomography (CT) and magnetic resonance imaging (MRI) scans are the standard imaging tests to diagnose strokes. They help distinguish between ischemic and hemorrhagic strokes. These tests can show signs of bleeding and can also help indicate whether a stroke is recent. MRIs are better than CT scans at differentiating between a hemorrhagic stroke and an ischemic stroke during the first few hours after symptoms begin. MRIs are also the preferred imaging technique for evaluating patients with probable TIA. However, an MRI can take longer to perform than a CT and is sometimes not as widely available. For these reasons, a CT scan may be used as the initial imaging test instead of MRI. Magnetic resonance angiography (MRA) and computerized tomography angiography of the head and neck are noninvasive ways of evaluating the carotid arteries and the arteries in the brain. In many situations, these tests can be used instead of cerebral angiography. Carotid ultrasound procedures are valuable tools for measuring the width of the artery and how the blood flows through it. Carotid ultrasounds can help determine the severity of plaque build-up and narrowing and blocking of the carotid arteries (carotid stenosis). 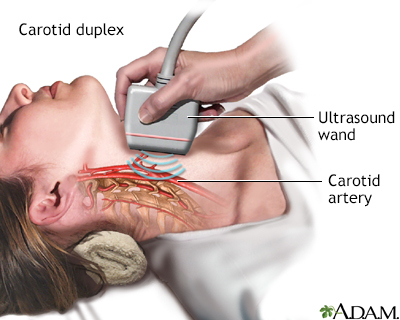 In carotid ultrasounds, high-frequency sound waves are directed from a hand-held transducer probe to the target area. These waves "echo" off the arterial structures and produce a two-dimensional image on a monitor, which will make obstructions or narrowing of the arteries visible. Cerebral angiography is an invasive procedure that may be used for patients with stroke or TIAs who may need a procedure. It requires the insertion of a catheter into the groin, which is then threaded up through the arteries to the base of the carotid artery. At this point a dye is injected, and x-rays, CTs, or MRI scans determine the location and extent of the narrowing, or stenosis, of the artery. A heart evaluation using an electrocardiogram (ECG) is important in any patient with a stroke or suspected stroke. An ECG records the electrical current in the heart muscle. It may detect arrhythmias such as atrial fibrillation (a major cause of stroke) or give clues as to other heart problems. Transthoracic echocardiograms (TTE) view the heart through the chest. It is noninvasive and is the standard approach. Transesophageal echocardiogram (TEE) examines the heart using an ultrasound tube that the patient swallows and passes down the throat. It is uncomfortable and requires sedation. It is typically used to obtain more accurate images of certain parts of the heart and aorta. TEE is more likely to be used when there is no likely cause of stroke identified with less invasive testing, particularly in younger patients. Based on the number of points, a doctor can identify whether a patient is at low, moderate, or high risk of having a stroke within 2 days after a TIA. The ABCD2 score can help doctors better decide which patients need hospitalization and emergency care. A stroke requires immediate emergency treatment. It is critical to get to the hospital and be diagnosed as soon as possible. There are several steps in the initial assessment and management of stroke. Receiving treatment early is essential in reducing the damage from a stroke. The chances for survival and recovery are also best if treatment is received at a hospital specifically certified as a primary stroke center. Immediate treatment of ischemic stroke aims at dissolving the blood clot. Patients who arrive at the emergency room with signs of acute ischemic stroke are usually given aspirin to help thin the blood. Aspirin can be lethal for patients suffering a hemorrhagic stroke, so it is best not to take aspirin at home and to wait until after the doctor has determined what kind of stroke has occurred. If patients can be treated within 3 to 4.5 hours of stroke onset (when symptoms first appear), they may be candidates for thrombolytic ("clot-buster") drug therapy. Thrombolytic drugs are used break up existing blood clots. The standard thrombolytic drugs are tissue plasminogen activators (tPAs). They include alteplase (Activase) and reteplase (Retavase). Before the thrombolytic is given, a CT scan must first confirm that the stroke is not hemorrhagic. If the stroke is ischemic, a CT scan can also suggest if injuries are very extensive, which might affect the use of thrombolytics. A blood glucose measurement should also be performed. Thrombolytics should generally be administered within 3 hours of a stroke. Best results are achieved if patients are treated within 60 minutes of arriving at the hospital. According to guidelines from the American Heart Association and American Stroke Association, some patients may benefit from treatment with a thrombolytic within 4.5 hours after stroke symptoms begin. These patients include those who are younger than 80 years, are having a less severe stroke, do not have a history of stroke or diabetes, and do not take anticoagulant (blood-thinner) drugs. Patients who do not meet these criteria should probably not be treated with a thrombolytic after the 3-hour window. Thrombolytics carry a risk for hemorrhage, so they may not be appropriate for patients with existing risk factors for bleeding. A clot-buster drug is usually administered through an intravenous injection. Less commonly, the drug may be administered through a catheter that is inserted in the groin and threaded through to the arteries in the brain (a procedure called intra-arterial thrombolysis). Another alternative treatment for clot removal is called mechanical thrombectomy. It uses a self-expanding stent (wire mesh) called stent retriever to capture and retrieve the clot. The device is inserted into the blocked artery through a catheter and then removed along with the clot. Have received thrombolytic therapy within 4 to 5 hours of onset of symptoms. Have blockage of the internal carotid artery, the middle or anterior cerebral arteries, and their larger branches. Were able to receive treatment within 6 hours after symptoms began. Treatment of hemorrhagic stroke depends in part on whether the stroke is caused by bleeding between the brain and the skull (subarachnoid hemorrhage) or within the brain tissue (intracerebral hemorrhage). Both medications and surgery may be used. Various types of drugs are given depending on the cause of the bleeding. If high blood pressure is the cause, antihypertensive medications are administered to lower blood pressure. If anticoagulant medications such as warfarin (Coumadin, generic) or heparin are the cause, they are immediately discontinued and other drugs may be given to increase blood coagulation. Other drugs, such as the calcium channel blocker nimodipine (Nimotop), can help reduce the risk of ischemic stroke following hemorrhagic stroke. High blood pressure (hypertension) is one of the main causes of intracerebral hemorrhage. Bleeding in or around the brain causes swelling of brain tissue. The surgical approach is a craniotomy, which involves making an opening in the skull bone to remove excess blood and reduce pressure on the brain. Arteriovenous malformations (AVMs) are tangles of abnormal blood vessels. AVMs are the other main cause of intracerebral hemorrhage. There are several surgical techniques for repairing AVMs. They include surgery to remove the AVM or radiation therapy to shrink the AVM. Embolization treatment involves inserting a catheter into an artery in the groin and threading it through to the blood vessels in the brain. A liquid is injected into the catheter to seal off the AVM. Aneurysms are the main causes of subarachnoid hemorrhage. An aneurysm is a balloon-like bulge in a blood vessel. Surgery for aneurysms involves either surgical clipping or endovascular coiling. With clipping, the surgeon makes an incision in the skull and places a clamp on the aneurysm to prevent further leaking of blood into the brain. With coiling, a tiny coil is inserted into a catheter placed in the groin and threaded through to the aneurysm. Blood clots that form around this coil prevent the aneurysm from breaking open and bleeding. In the days following stroke, patients are at risk for complications. The following steps are important. It is very important to maintain oxygen levels. In some cases, airway ventilation may be required. Supplemental oxygen may also be necessary for patients when tests suggest low blood levels of oxygen. Fever should be monitored and aggressively treated with medication and, if needed, a cooling blanket since its presence predicts a poorer outlook. Patients should have their swallowing function evaluated before they are given any food, fluid, or medication by mouth. If patients cannot adequately swallow they are at risk of choking. Patients who cannot swallow on their own may require nutrition and fluids delivered intravenously or through a tube placed in the nose. Maintaining a healthy electrolyte balance (the ratio of sodium, calcium, and potassium in the body's fluids) is critical. Managing blood pressure is essential, but complicated. Blood pressure often declines spontaneously in the first 24 hours after stroke. Patients whose blood pressure remains elevated should be treated carefully with antihypertensive medications. Hospital staff should watch closely for evidence of increased pressure on the brain (cerebral edema), which is a frequent complication of hemorrhagic strokes. It can also occur a few days after ischemic strokes. Early symptoms of increased brain pressure are drowsiness, confusion, lethargy, weakness, and headache. Medications such as mannitol may be given during a stroke to reduce pressure or the risk for it. Keeping the top of the body higher than the lower part, such as by elevating the head of the bed, can reduce pressure in the brain and is standard practice for patients with ischemic stroke. However, this practice also lowers blood pressure in general, which may be dangerous for patients with massive stroke. Patients must be monitored using electrocardiography to check for atrial fibrillation and other heart rhythm problems. Patients are at high risk for heart attack following stroke. Elevated blood sugar (glucose) levels can occur with severe stroke and may be a marker of serious trouble. Patients with high blood glucose levels may require insulin therapy. Regular tests for blood coagulation are important to make sure that the blood is not so "thick" that it will clot nor so "thin" that it causes bleeding. Deep venous thrombosis (DVT) is a blood clot in the veins of the lower leg or thigh. It can be a serious post-stroke complication because there is a risk of the clot breaking off and traveling to the brain or heart. DVT can also cause pulmonary embolism if the blood clot travels to the lungs. If necessary, an anticoagulant drug will be given. Patients who have had a stroke are at increased risk for pneumonia, urinary tract infections, and other widespread infections. Patients who have had a first stroke or TIA are at high risk of having another stroke. Secondary prevention measures are essential to reduce this risk. Smoking is a major risk factor for stroke. Patients should also avoid exposure to second-hand smoke. Patients should make dietary changes to follow a diet rich in fruits and vegetables, high in potassium, and low in saturated fats. Everyone should limit sodium (salt) intake to less than 2,400 mg/day, and some people may benefit from limiting sodium to less than 1,500 mg/day. Sodium restriction is particularly important for people over age 50, all African-Americans, and everyone with high blood pressure. For diet plans, the Dietary Approaches to Stop Hypertension (DASH) diet and the Mediterranean diet may be particularly good choices for reducing the risk of stroke. Exercise helps reduce the risk of atherosclerosis, which can help reduce the risk of stroke. Doctors recommend at least 30 minutes of exercise on most, if not all, days of the week. Patients who are overweight should try to lose weight through healthy diet and regular exercise. Heavy alcohol use and binge drinking increase the risk of both ischemic and hemorrhagic stroke. If you drink, limit alcohol to no more than one drink a day for women or two drinks a day for men. Your doctor may suggest your taking aspirin or, if you cannot take aspirin, another antiplatelet drug such as clopidogrel (Plavix, generic) to help prevent blood clots from forming in your arteries or your heart. These medicines are called antiplatelet drugs. These drugs make blood platelets less sticky and therefore less likely to form a clot. You should never start taking aspirin without first talking to your doctor. Primary prevention is when antiplatelet drugs are taken before a stroke or a TIA has occurred. 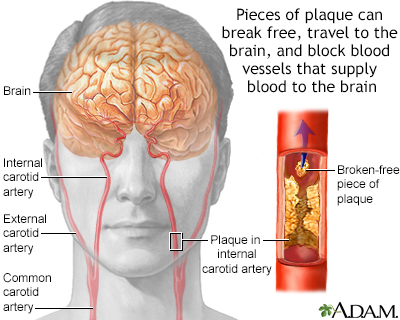 Before deciding whether someone should take aspirin to prevent a stroke caused by a blockage in an artery (ischemic stroke), your doctor must consider whether you are at an increased risk of strokes caused by bleeding in the brain (hemorrhagic stroke), as well as bleeding elsewhere in the body. The American Heart Association (AHA) recommends that people who have heart disease should take daily low-dose aspirin (81 mg a day), if told to by their doctor, for primary prevention of stroke or heart attack. Aspirin therapy may also be recommended as primary prevention for certain patients at increased risk for heart disease (for example, patients with diabetes who smoke). New guidelines on stroke prevention in women recommend low-dose aspirin therapy for patients with pregnancy-related hypertension (preeclampsia). For these patients, the benefits of aspirin outweigh its risks, which include bleeding in the stomach and brain. Healthy people who do not have heart disease, or a history of heart attack or stroke, should not take daily aspirin. After an ischemic stroke or a TIA, aspirin alone or aspirin plus the antiplatelet drug dipyridamole (Persantine, or Aggrenox when combined in one pill with aspirin) given twice daily is recommended to prevent another stroke. Clopidogrel (Plavix, generic) may be used in place of aspirin for patients who have narrowing of the coronary arteries or who have had a stent inserted. Combining aspirin and clopidogrel together does not have any more benefit and increases the risk for hemorrhage (although some patients who have had a coronary artery stent placed may need to be on this combination to keep their stents open). Anticoagulants are also referred to as anti-clotting or "blood thinner" drugs. They are used to help prevent blood clots and stroke. They are generally considered the best medications for stroke prevention for most patients with atrial fibrillation who are at medium to high risk for stroke. Anticoagulants may also be recommended for those with rheumatic heart disease, dilated cardiomyopathy, prosthetic or man-made heart valve, and a blood clot that remains in the left ventricle (ventricular thrombus). Warfarin (Coumadin, generic) has been the main anticoagulant ("blood thinner") drug used to prevent strokes in high-risk patients with atrial fibrillation. Like all anticoagulants, warfarin carries a risk for bleeding. But for most patients its benefits far outweigh its risks. The risk for bleeding is highest when warfarin therapy is first started, with higher doses, and with long periods of treatment. Patients at risk for bleeding are usually older (over 65) and have a history of stomach bleeding, uncontrolled high blood pressure, alcohol abuse, or abnormal liver or kidney function. It is important that patients who take warfarin have their blood checked regularly to make sure that it does not become "too thin." Blood that is too thin increases the risk for bleeding, while blood that is "too thick" increases the risk for blood clots and stroke. Prothrombin time (PT) and international normalized ratio (INR) tests are used to monitor blood coagulation. Unlike warfarin, these drugs do not require regular blood test monitoring. However, dabigatran and rivaroxaban need to be taken twice-daily (warfarin and apixaban are taken once a day). Dabigatran appears to cause more gastrointestinal problems (indigestion, upset stomach, abdominal pain) than the other anticoagulants. Compared to warfarin, dabigatran also has a higher risk for gastrointestinal bleeding. But it has a lower risk for bleeding in the brain and clot-related strokes. There are some other differences between the various medications including that some must be used with caution in patients with kidney problems. All anticoagulant drugs increase the risk for bleeding. A concern with the newer anticoagulants is that if bleeding does occur, the drug effect is irreversible. In contrast, vitamin K or the administration of fresh frozen plasma (a donated blood product) can rapidly reverse the anticoagulant effect of warfarin. People with diabetes should aim for good blood glucose level control with a goal of hemoglobin A1c levels of around 7%. Blood pressure goals for people with diabetes should generally be 140/80 mm Hg or less. High blood pressure (hypertension) increases the risk for stroke. A normal blood pressure is below 120/80. High blood pressure is above 140/90. 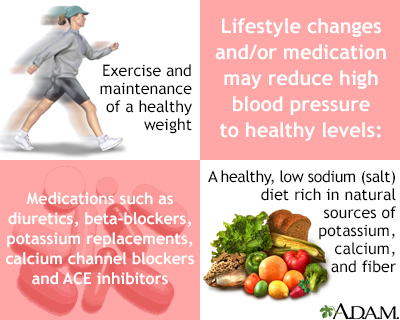 Reducing high blood pressure is essential in stroke prevention. 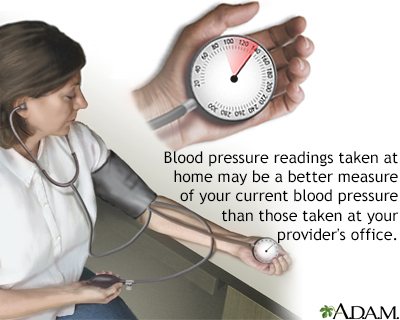 In general, most patients with hypertension should aim for blood pressure below 140/90 mm Hg. Experts and major guidelines do not entirely agree on a target blood pressure for those with a history of cardiovascular disease or stroke. While some claim the evidence to support lowering blood pressure below 140/90 mm Hg is very weak, others recommend lowering systolic blood pressure ranges to anywhere from 125 to 135 mm Hg. Drug therapy is recommended for people with hypertension who cannot control their blood pressure through diet and other lifestyle changes. Many different types of drugs are used to control blood pressure. They include diuretics, ACE inhibitors, angiotensin-receptor blockers, beta-blockers, and calcium channel blockers. For patients with TIA or ischemic stroke due to atherosclerosis, high intensity step therapy is recommended, regardless of baseline total LDL cholesterol level. Statin brands include lovastatin (Mevacor, generic), pravastatin (Pravachol, generic), simvastatin (Zocor, generic), fluvastatin (Lescol), atorvastatin (Lipitor, generic), rosuvastatin (Crestor), and pitavastatin (Livalo). The 2 main surgical procedures for stroke prevention are carotid endarterectomy (CAE) and carotid angioplasty with stenting (CAS). For patients more than age 70, carotid endarterectomy appears to have better outcomes than carotid angioplasty with stenting. For younger patients, both procedures have similar risks for post-operative complications and long-term risk of future stroke. There are also other reasons to choose one procedure over the other. These reasons include surgical risk factors and anatomic considerations (where the blockages are located). Carotid endarterectomy is a surgical procedure that cleans out plaque and opens up the narrowed carotid arteries in the neck. It is recommended to prevent ischemic stroke in some patients who have symptoms of carotid artery stenosis and carotid narrowing of 70% to 99%. For people whose carotid arteries are narrowed by 50% or less, antiplatelet medications are usually recommended in place of surgery. For patients with moderate stenosis (50% to 69%), the decision to perform surgery needs to be determined on an individual basis. There is a risk of a heart attack or stroke from the procedure. Anyone undergoing this procedure should be sure their surgeon is experienced in performing this procedure and that the medical center has complication rates of less than 6%. Carotid endarterectomy is generally not recommended for patients with acute stroke. The patient is usually given general anesthesia, although a local anesthetic is sometimes used. The surgeon cuts open the carotid artery and scrapes away the plaque on the arterial wall. The artery is sewn back together, and blood flow is restored. The patient generally stays in the hospital for about 1 to 2 days. There is often a slight aching in the neck for about 2 weeks, and the patient should refrain as much as possible from turning the head during this period. Patients may temporarily lose sensation in the neck area. It will go away within a few months. Endarterectomy is a surgical procedure that removes plaque material from the lining of an artery. Click the icon to see an image series about carotid artery surgery. Carotid angioplasty and stenting (CAS) may be used as an alternative to carotid endarterectomy for some patients. It is based on the same principles as angiography done for heart disease. A thin catheter tube is inserted into an artery in the groin. It is threaded through the circulatory system until it reaches the blocked area in the carotid artery. The doctor either breaks up the clot or inflates a tiny balloon against the blood vessel walls (angioplasty). After temporarily inflating the balloon, the doctor typically leaves a circular wire mesh (stent) inside the vessel to keep it open. This procedure carries a risk for an embolic stroke and other complications. It is often used in hospitals as an alternative procedure for patients who cannot undergo endarterectomy, especially for patients with severe stenosis (blockage greater than 70%) and high surgical risk. Similar procedures to those done to treat carotid artery narrowing have been studied for the vertebral arteries. However, vertebral artery angioplasty and stenting carries a lot more risk of bad outcomes during and after the surgery. As a result, medical treatment only is recommended for symptoms or findings in the vertebral artery system. If unruptured aneurysms are discovered in time, they can be treated before causing problems. People who are known to have an aneurysm may need regular doctor visits to make sure the aneurysm is not changing size or shape. Treating high blood pressure may reduce the chance that an existing aneurysm will rupture. Controlling risk factors for atherosclerosis may reduce the likelihood of aneurysms from expanding or rupturing. The decision to repair an unruptured cerebral aneurysm is based on the size and location of the aneurysm, and the patient's age and general health. Even if there are no symptoms, your doctor may order treatment to prevent a future, and possibly fatal rupture. But not all aneurysms need to be treated right away. Those that are very small (less than 3 mm) are less likely to break open. Your doctor will help you decide whether or not it is safer to have surgery to block off the aneurysm before it can break open (rupture). Sometimes, people are too ill to have surgery, or it may be too dangerous to treat the aneurysm because of its location. Clipping is done during open brain surgery (craniotomy). Endovascular repair is most often done. It usually involves a coil or coiling. This is a less invasive way to treat some aneurysms. You are given general anesthesia and a breathing tube. Your scalp, skull, and the coverings of the brain are opened. A metal clip is placed at the base (neck) of the aneurysm to prevent it from breaking open (bursting). You may have general anesthesia and a breathing tube. Or, you may be given medicine to relax you, but not enough to put you to sleep. A catheter is guided through a small cut in your groin to an artery and then to the blood vessel in your brain where the aneurysm is located. Contrast material is injected through the catheter. This allows the surgeon to view the arteries and the aneurysm on a monitor in the operating room. Thin metal wires are put into the aneurysm. They then coil into a mesh ball. For this reason, the procedure is also called coiling. Blood clots that form around this coil prevent the aneurysm from breaking open and bleeding. Sometimes stents (mesh tubes) are also put in to hold the coils in place. During and right after the procedure, you may be given heparin. This medicine prevents dangerous blood clots from forming. For the best chance of improvement and regaining abilities, it is important that rehabilitation starts as soon as possible after a stroke. Rehabilitation therapy is started in the hospital as soon as a patient's condition has stabilized. Initial range of motion exercises involve a nurse or physical therapist moving a patient's affected limb (passive exercise) and having the patient practice moving the limb (active exercise). Patients are encouraged to gradually sit, stand, and walk, and then perform tasks of daily living (such as bathing, dressing, and using the toilet). Some patients will experience recover quickly and regain functional abilities in the first few days, while others will continue to show improvement during the first 6 months or longer. Recovery is an ongoing process and with good rehabilitation providers and family support, patients can continue to make progress. Paralysis or Problems Controlling Movement (Motor Control). Paralysis tends to occur on opposite side of the body from the side of the brain damage. If someone has brain damage on the left side of the brain, the right side of the body will be affected, and the reverse is also true. One-sided paralysis is called hemiplegia, and one-sided weakness is called hemiparesis. Hemiplegia or hemiparesis can affect a person's ability to walk or grasp objects. Loss of muscle control can also cause problems swallowing (dysphagia) or speaking (dysarthria). Patients may also have difficulty with coordination and balance (ataxia). Sensory Disturbances Including Pain. Stroke can affect the ability to feel touch, pain, temperature, or position. Pain, numbness, and tingling or pricking sensations can occur in the paralyzed or weakened limb (paresthesia). Sometimes patients have problems recognizing their affected arm or leg. Some stroke survivors experience chronic pain, which often results from a joint becoming immobilized or "frozen." Muscle stiffness or spasms are common. Sensory disturbances can also affect the ability to urinate or control bowels. Problems Using or Understanding Language (Aphasia). Many stroke survivors have language impairments, which affect the ability to speak, write, and understand spoken or written language. This condition is called aphasia. Sometimes patients will know the right words but have problems saying them (dysarthria). Problems with Thinking and Memory. Stroke can affect attention span and short-term memory. This can impair the ability to make plans, learn new tasks, follow instructions, or comprehend meaning. Some stroke survivors are unable to recognize or understand their physical impairments or are unaware of sensations affecting the stroke-impaired side of the body. Emotional Disturbances. Some emotional and personality changes that follow a stroke are caused by the effects of brain damage. Clinical depression is very common, and is not only a psychological response to stroke but a symptom of physical changes in the brain. Patients may have difficulty controlling emotions or may exhibit inappropriate emotional responses (crying, laughing, or smiling for no apparent reason). Exercise program. Guidelines from the Veteran's Administration recommend that patients get back on their feet as soon as possible to prevent deep vein thrombosis. Patients should try to walk at least 50 feet a day. Assisted devices or bracing are sometimes used to help support the legs. Treadmill exercises can be very helpful for patients with mild-to-moderate dysfunction. Exercise should be tailored to the stroke survivor's physical condition and can include aerobic, strength, flexibility, and neuromuscular (coordination and balance) activities. Retraining muscles. Stretching and range-of-motion exercises are used to help treat spastic muscles. They can also help patients regain function in a paralyzed arm. Multiple techniques have been developed and studied. Speech therapy and sign language. Intense speech therapy after a stroke is important for recovery. Some doctors recommend 9 hours a week of therapy for 3 months. Language skills improve the most when family and friends help reinforce the speech therapy lessons. Swallowing training. Training patients and their caregivers regarding swallowing techniques, as well as safe and not-safe foods and liquids, is essential for preventing aspiration (accidental sucking in of food or fluids into the airway). Attention training. Problems with attention are very common after strokes. Direct retraining teaches patients to perform specific tasks using repetitive drills in response to certain stimuli. (For example, they are told to press a buzzer each time they hear a specific number.) A variant of this approach trains patients to relearn real-life skills, such as driving, carrying on a conversation, or other daily tasks. Occupational training. Occupational therapy is important and improves daily living activities and social participation. Dantrolene (Dantrium, generic), tizanidine (Zanaflex, generic), and baclofen (Lioresal, Gablofen, generic) are used to treat spasticity. Botox injections are approved for treatment of upper limb spasticity (such as the elbow, wrist, or fingers). Heparin, a blood-thinning drug, is used to prevent blood clots from forming in the veins of the legs (thrombosis). Some patients experience constant hiccups, which can be very serious. Chlorpromazine and baclofen are among the drugs used for this condition. Antidepressants may be prescribed for treatment of depression. A stroke is emotionally challenging both for patients and their families. The caregiver's emotions and responses to the patient are critical. Patients do worse when caregivers are depressed, overprotective, or not knowledgeable about the stroke. They do best when caregivers and family are encouraging and supportive. Everyone benefits when patients are able to function as independently as possible to the best of their abilities. Berkhemer OA, Fransen PS, Beumer D, et al. A randomized trial of intraarterial treatment for acute ischemic stroke. N Engl J Med. 2015;372:11-20. PMID: 25517348 www.ncbi.nlm.nih.gov/pubmed/25517348. Biller J, Ruland S, Schneck MJ. Ischemic cerebrovascular disease. In: Daroff RB, Jankovic J, Mazziotta JC, Pomeroy SL, eds. Bradley's Neurology in Clinical Practice. 7th ed. Philadelphia, PA: Elsevier; 2016:chap 65. Brott TG, Howard G, Roubin GS, et al. Long-Term Results of Stenting versus Endarterectomy for Carotid-Artery Stenosis. N Engl J Med. 2016;374(11):1021-1031. PMID: 26890472 www.ncbi.nlm.nih.gov/pubmed/26890472. Bushnell C, McCullough LD, Awad IA, et al. Guidelines for the prevention of stroke in women: a statement for healthcare professionals from the American Heart Association/American Stroke Association. Stroke. 2014;45(5):1545-1588. PMID: 24503673 www.ncbi.nlm.nih.gov/pubmed/24503673. Compter A, van der Worp HB, Schonewille WJ, et al. Stenting versus medical treatment in patients with symptomatic vertebral artery stenosis: a randomised open-label phase 2 trial. Lancet Neurol. 2015;14(6):606-614. PMID: 25908089 www.ncbi.nlm.nih.gov/pubmed/25908089. Goldstein LB. Prevention and management of ischemic stroke. In: Mann DL, Zipes DP, Libby P, Bonow RO, Braunwald E, eds. Braunwald's Heart Disease: A Textbook of Cardiovascular Medicine. 10th ed. Philadelphia, PA: Elsevier Saunders; 2015: chap 59. Gracies JM, Brashear A, Jech R, et al. Safety and efficacy of abobotulinumtoxinA for hemiparesis in adults with upper limb spasticity after stroke or traumatic brain injury: a double-blind randomised controlled trial. Lancet Neurol. 2015;14(10):992-1001. PMID: 26318836 www.ncbi.nlm.nih.gov/pubmed/26318836. Halliday A, Harrison M, Hayter E, et al. 10-year stroke prevention after successful carotid endarterectomy for asymptomatic stenosis (ACST-1): a multicentre randomised trial. Lancet. 2010;376(9746):1074-1084. PMC: 2956884 www.ncbi.nlm.nih.gov/pmc/articles/PMC2956884/. James PA, Oparil S, Carter BL, et al. 2014 evidence-based guideline for the management of high blood pressure in adults: report from the panel members appointed to the Eighth Joint National Committee (JNC 8). JAMA. 2014;311(5):507-520. PMID: 24352797 www.ncbi.nlm.nih.gov/pubmed/24352797. Jauch EC, Saver JL, Adams HP Jr, et al. Guidelines for the early management of patients with acute ischemic stroke: a guideline for healthcare professionals from the American Heart Association/American Stroke Association. Stroke. 2013;44(3):870-947. PMID: 23370205 www.ncbi.nlm.nih.gov/pubmed/23370205. Kernan WN, Ovbiagele B, Black HR, et al. guidelines for the prevention of stroke in patients with stroke and transient ischemic attack: A Guideline for Healthcare Professionals From the American Heart Association/American Stroke Association. Stroke. 2014;45(7):2160-2236. PMID: 24788967 www.ncbi.nlm.nih.gov/pubmed/24788967. Lansberg MG, O'Donnell MJ, Khatri P, et al. Antithrombotic and thrombolytic therapy for ischemic stroke: antithrombotic therapy and prevention of thrombosis, 9th ed: American College of Chest Physicians Evidence-Based Clinical Practice Guidelines. Chest. 2012 ;141(2 Suppl):e601S-e636S. PMID: 22315273 www.ncbi.nlm.nih.gov/pubmed/22315273. Meschia JF, Bushnell C, Boden-Albala B, et al. Guidelines for the primary prevention of stroke: a statement forhealthcare professionals from the American Heart Association/American StrokeAssociation. Stroke. 2014 ;45(12):3754-3832. PMID: 25355838 www.ncbi.nlm.nih.gov/pubmed/25355838. Pan A, Sun Q, Okereke OI, Rexrode KM, Hu FB. Depression and risk of stroke morbidity and mortality: a meta-analysis and systematic review. JAMA. 2011;306(11):1241-1249. PMID: 21934057 www.ncbi.nlm.nih.gov/pubmed/21934057. Powers WJ, Derdeyn CP, Biller J, et al. 2015 American Heart Association/American Stroke Association focused update of the 2013 guidelines for the early management of patients with acute ischemic stroke regarding endovascular treatment: A Guideline for Healthcare Professionals From the American Heart Association/American Stroke Association. Stroke. 2015;46(10):3020-3035. PMID: 26123479 www.ncbi.nlm.nih.gov/pubmed/26123479. Prabhakaran S, Ruff I, Bernstein RA. Acute stroke intervention: a systematic review. JAMA. 2015;313(14):1451-1462. PMID: 25871671 www.ncbi.nlm.nih.gov/pubmed/25871671. Rosenfield K, Matsumura JS, Chaturvedi S, et al. Randomized Trial of Stent versus Surgery for Asymptomatic Carotid Stenosis. N Engl J Med. 2016;374(11):1011-1020. PMID: 26886419 www.ncbi.nlm.nih.gov/pubmed/26886419. Saunders DH, Greig CA, Mead GE. Physical activity and exercise after stroke: review of multiple meaningful benefits. Stroke. 2014;45(12):3742-3747 PMID: 25370588 www.ncbi.nlm.nih.gov/pubmed/25370588. Thompson BG, Brown RD Jr, Amin-Hanjani S, et al. Stroke. 2015;46(8):2368-2400. PMID: 26089327 www.ncbi.nlm.nih.gov/pubmed/26089327. You JJ, Singer DE, Howard PA, et al. Antithrombotic therapy for atrial fibrillation: antithrombotic therapy and prevention of thrombosis, 9th ed: American College of Chest Physicians Evidence-Based Clinical Practice Guidelines. Chest. 2012;141(2 Suppl):e531S-e575S. PMID: 22315271 www.ncbi.nlm.nih.gov/pubmed/22315271. AHA: What Can the Ability to Balance Reveal About Brain Health?